After Christmas or even after birthdays, you may find yourself wondering where on earth you’re going to store all these extra toys. Yes, I’ve been going through this myself. There comes a time where purchasing a little extra toy storage is the practical solution. 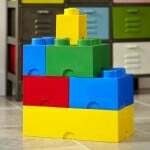 In this post I will explore some kids storage ideas and hopefully you can find space for all those extra toys. Toy nets, Boxes And Units. I think it’s good to have a range of storage when possible and try and rotate toys around. All too often, toys end up put into boxes and your child just forgets they exist. A good tip is to switch things around every now and then. 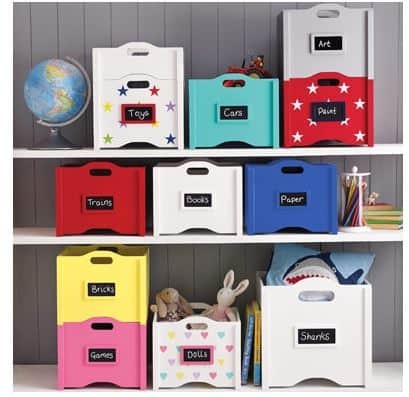 If you have boxes you can stack, rotate the top one around, so that the toys on the bottom and middle are revealed more often – or if they’re just in regular toy boxes, switch some of the boxed items to be on the shelf or hanging in a toy net. Sometimes, just reminding your child that certain toys exist can be enough to encourage them to be played with again! Don’t you remember being a kid and suddenly discovering that toy you loved and had totally forgotten about or thought you’d lost it? Do you remember how great it felt to rediscover it again? 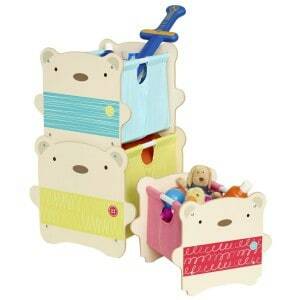 Very cute stackable bear toy boxes, that come in three colours. Easy to put together and instructions included. 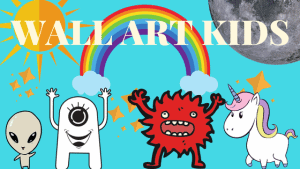 They’d make a lovely edition to a nursery and make tidying up simple and fun for small children. I love these stacking toy boxes from Great Little Trading Co. They come in various sizes and with different patterns available too (star, heart and rainbow star). 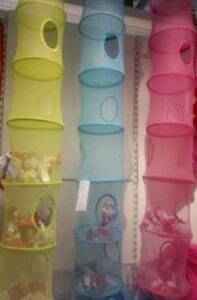 With a combo of designs and colours, these would look lovely stacked up. My children have these hanging nets in their room and I think they are excellent value. The holes in them are quite small, so they won’t hold large toys – more for smaller things such as, small soft toys, or cars/trucks. 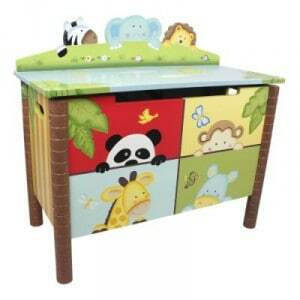 This is a really fantastic value and colourful toy storage unit. It’s also a good way your child can organise their toys – by having a set box for a specific type of toy. Which would also make it easier to find the toy they want to play with! Simple to put together and take apart. free delivery with orders over £20. The unit also comes in a choice of colours. 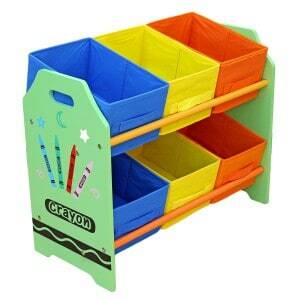 This is more of an all in one unit, where you can certainly store toys as well as clothes. I love how colourful it is, with the cute characters depicted on each square. It’s a versatile unit, as it can be stacked vertically or horizontally, depending on the space you have. Each cube dimension is 37 x 37 x 37cm and each cube can hold up to 10kg of weight. In addition, two clothes rails are supplied if you’d like to create a wardrobe space. A quality steel structure, but still lightweight and simple to assemble – no screws or glue needed, but a free wooden mallet is also included so that children can help build it too! If you’re looking for a quality piece of furniture, which is also practical as a toy chest – this toy chest is hand painted and hand carved. If you’re looking to create a safari themed bedroom, then this would make a lovely edition too. The dimensions are – 77.8 x 39.4 x 71.1cm and free delivery available in the UK. I couldn’t complete this post without dedicating a section to LEGO! Storing lego can be a pain. In the past it’s ended up in a random toy box and mixed up with all the other toys – so, you end up losing all the individual bits and it ends up not being played with – sound familiar at all? So, it’s a good idea to have a designated space just for lego and here are a few products that can help you out!. Top left – Agooding toy play mat and storage, this mat doubles up as a bag, so you can use it to play with the lego and then simply tie it all up together again and all your lego or duplo will stay safe within the bag! 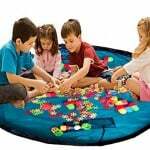 Agooding Children Play Mat/Bag! 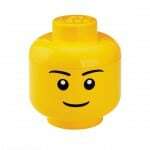 Top right – A change from the traditional lego head container, this one is a skeleton. There is also a pumpkin head available! 2.2 litre capacity. 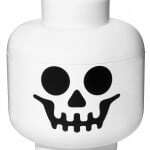 Skeleton Lego head! Middle left – a great storage solution if you have a tonne of lego to store, but equally you could use it for other toys too. It’d make a great edition to a Lego themed bedroom! Would also look great in an office, for adult lego fans! Giant Lego storage boxes here! Middle Right – A neat way to store and showcase Lego figures, that can so easily get lost. Each case holds 16 figures. It also comes in black. LEGO large minifigure case here! 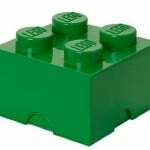 Bottom right – A simple green lego storage block, which you can get in various other colours. If you buy several, they also work as giant building blocks, so are a nice way to decorate the bedroom as well as a storage solution. Find it here! 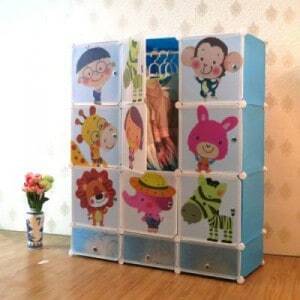 Do you have any other favourite ways to store your kids toys? Leave me a comment below! If you enjoyed this post, please share with friends and family on social media, via the sharing icons below!